View of Astonbury House in Hertfordshire. Aston is a small village in North Hertforshire, 31 miles north of London. It is recorded in the Domesday Book as ‘Eston’ and consisted of a small community of twenty fives families, including a priest, which suggests that there was also a church here. It was Sir Philip Boteler who commissioned the building of a three storey mansion house here in 1540. Stone from a ruined monastic building on the site was used in the construction of the house. 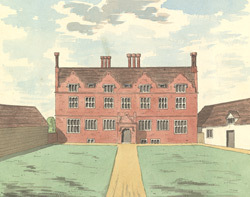 The house was completed by Boteler’s great grandson Sir Robert Boteler. In 1989 the house was converted into private apartments.